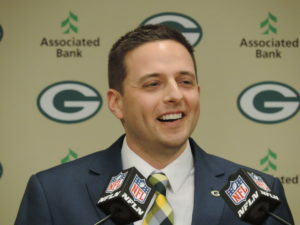 When the Green Bay Packers hired Brian Gutekunst as their next general manager, they passed on Eliot Wolf. Now Wolf is taking his expertise with him to Cleveland, joining John Dorsey and the Cleveland Browns. Wolf was a 14-year veteran of the Packers scouting team. He had an offer to remain with the Packers and could have joined Reggie McKenzie and Jon Gruden in Oakland as well. But in the end, after meeting with the Browns on Tuesday, he decided that would be the best place for him. Wolf served as the Packers director of football operations from 2016 to 2017. He most likely would have been named as an assistant GM in Green Bay, working alongside Gutekunst. But Wolf being passed over for the position that his father Ron Wolf once held, likely played a factor in his decision to move.